This news item was posted in Pakistani News, Videos category and has 10 Comments so far . 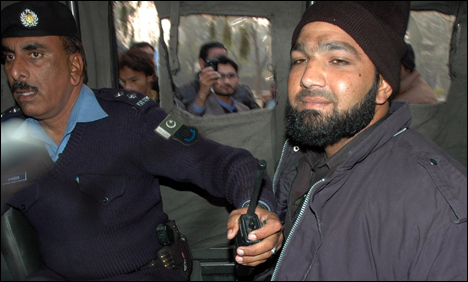 Ghazi Malik Mumtaz Qadri is one the guard of Governor Punjab Salman Taseer. Ghazi Malik Mumtaz Qadri says the Governor Punjab Salman Taseer is A Ghustakg-e-Rasool. Punjab Governor Salman Taseer was allegedly assassinated by a gunman of Punjab Elite Force Malik Mumtaz Hussain Qadri, Interior Minister Rehman Malik told reporters here on Tuesday. The minister said the alleged killer had made confession statement of killing the Governor over late Taseer’s statement billing the Blasphemy Law as a “black law. The killer after attacking the governor with his weapon has surrendered to the security forces moments after shooting the governor dead. Qadri was immediately arrested and police were interrogating him”, he added. Late Salman Taseer, he said, have had lunch along with one of his friends at a cafe in Kohsar Market of Islamabad. When he came out to ride his waiting car, he was shot dead. Earlier, the Governor had visited the President House and met Minister for Information and Broadcasting Qamar Zaman Kaira at the Parliament House. Why people are so fanatic in Pakistan? Why they don’t believe in judgement day? If we all take laws in our hands, why we need to worry about Judgement Day? If we all really believe in Allah, I think we need to allow Him to do his job rather than acking lile Allah. This is what happens when you feed day and night religion to any person. Pakistan is a terrorist failed system. You mullahs are good for nothing. Just because trash like you does not have the drive or motivation to be successful, you kill all those that strive to better. Shame on you….Nothing but a bunch of terrorists. app na bohat zabardas kam kiya hai..
app se inshallah allah or us k rasool b razii hogay..
allah app k liya khair karay?? ghazi malik mumtaz qadir teri jurat ko salam..
because aik muslim aisi baat soch b nahi sakta ….b/c we love allah and mohmmad s.a.w.w…. ya reaallly love mohammmad saww ..dosaray ghazi alam din hai ya..
aallah is ki hifazat karay ameen ..
the quran was written in 6th centuary by mohammad it is not a divine book. god does not write books if god had written quran then nothing could have been proven wrong in it by science. example quran and bible too says our earth is in the center of the universe and sun and moon go arround it to give us day and night, because this was the knowledge available at that time. it was in the 14th centuary that kepler told us that it is the sun in the center of our solar system and earth spins on its axis to give us day and night. in quran god is suppose to be saying that he only knows what a woman carries in her womb. well we also thanks to ultra sound. wake up muslims and stop worshipping a primitive book and mohammad both do not belong in the 21st centuary.